A sinus lift is a surgical procedure carried out by an oral surgeon to increase the amount of bone in the posterior maxillae (upper jaw) A sinus lift is needed if there is insufficient bone in the area of the upper premolars or molars for dental implant placement. 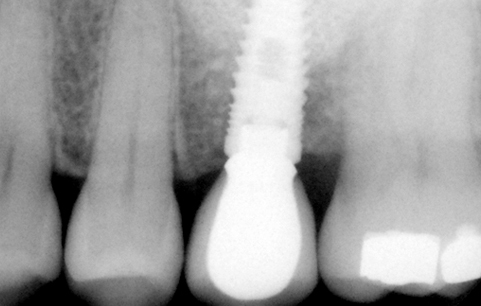 Dental implants needed a minimum depth and width of bone in order to be placed for long term function. Unfortunately in the upper premolar and molar region it is common to see bone loss once these teeth have been removed for some time. The maxillary sinuses are found on either side of the nose and are lined by a thin membrane. During the sinus lift procedure the membrane needs to be ‘lifted’ and bone deposited underneath. At Brighton Implant Clinic we recommend that this bone is left for 6-9 months to heal before dental implants can be restored. When do we need a sinus lift ? there is a lack of bone in the region of the upper premolars and molars. 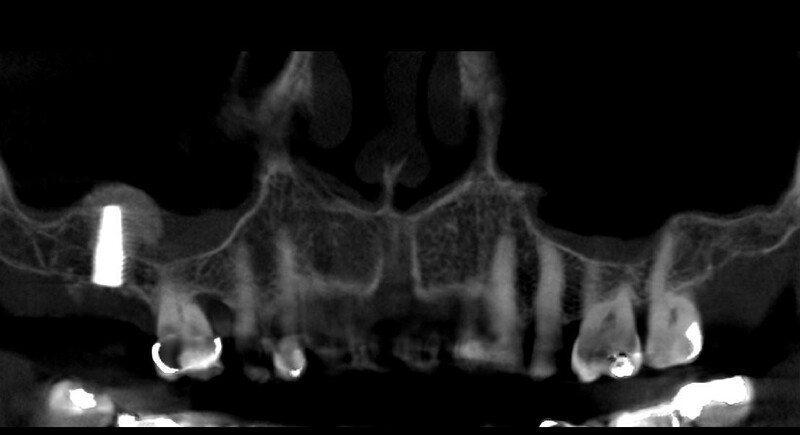 Sometimes the sinuses may be very large and also enlarge after teeth are removed making bone for dental implants limited. The upper jaw generally has less bone than the lower jaw. When natural teeth are extracted, it is natural for the surrounding bone to ‘shrink’ as well. 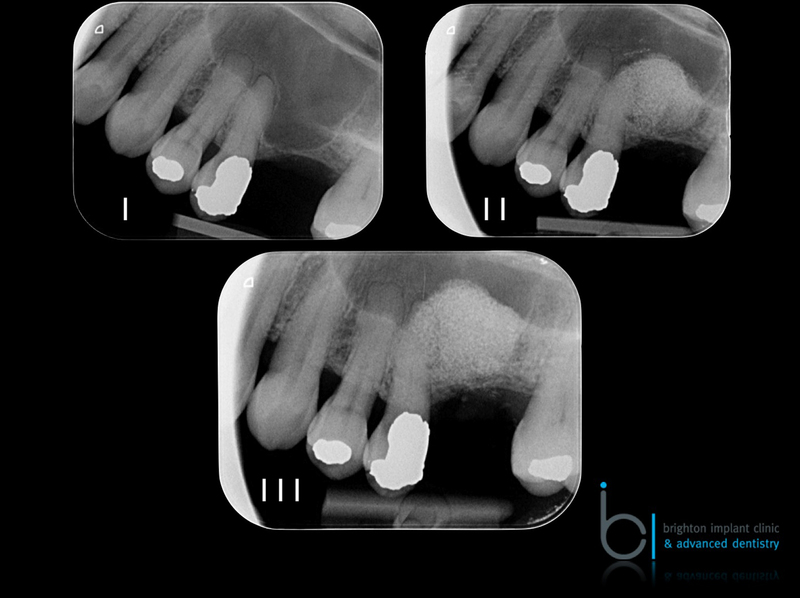 This bone resorption may affect the volume of bone which is needed for dental implants to be placed. The maxillary sinuses vary in size from one person to another. Some sinuses are larger than others. It has also been shown that the sinuses increase in size with age. Prior to undergoing a sinus lift procedure it is important to understand the anatomy of the sinus. 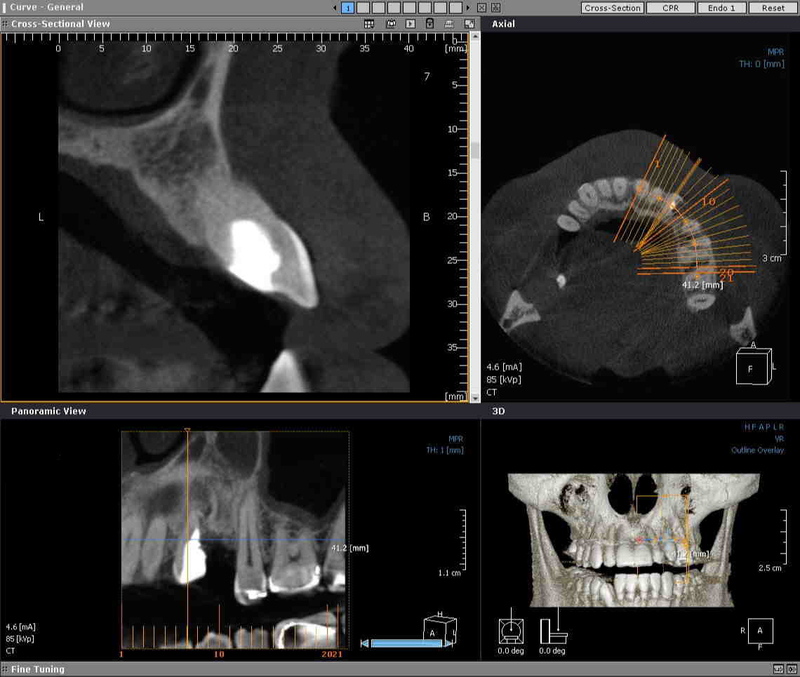 A CT scan is recommended of the area in order to see the area to be treated in 3 dimensions. The sinus lift procedure is usually carried out with artificial bone. At Brighton Implant Clinic we use Bovine derived Hydr0xyapatite Cerabone. The artificial bone is provided by specialised dental laboratories which have been tested and approved for surgical use in dentistry. In some cases the bone may be derived from your jaw bone or chin. This is less popular as it causes pain and discomfort in the donor area where the bone is harvested from. At Brighton Implant Clinic we recommend that the procedure be carried out under conscious sedation. The dentist will administer some local anaesthetic to the area, a small flap is raised to expose the area where the bone is needed. A small window is made in order to introduce the bone into the maxillary sinus. Once the window is completed the surgeon will gently raise the sinus membrane and introduce the artificial bone very carefully. The sinus lift procedure has become more popular since the development of dental implants. The procedure was introduced about 20 years ago. After the procedure it is very important that you do no blow your nose or sneeze forcefully. It is not uncommon to have some bleeding from the nose after the surgery. Antibiotics and pain killers will be prescribed by the surgeon. It is also recommended that an anti histamine medication be used if you suffer from sneezing with mild allergies. Dissolvable stitches are used to close the wound, these will usually stay in place for 10-14 days afterwards. In some cases the dental implants will have been placed at the same time as the sinus lift. At Brighton Implant Clinic we recommend that the new bone be left for 6-9 months to heal. It is not recommended to have any sinus lift procedure if you are a smoker. The chances of the graft failing due to poor blood supply are quite high.For further information see our post operative instructions following sinus surgery. The thin sinus membrane can be perforated accidentally during the procedure. This is quite common as the membrane is VERY thin. In some cases it may be impossible to raise the sinus membrane without having a perforation or tear on the membrane. In these cases it may be possible to repair the perforation using collagen based artificial membranes to cover the perforation. 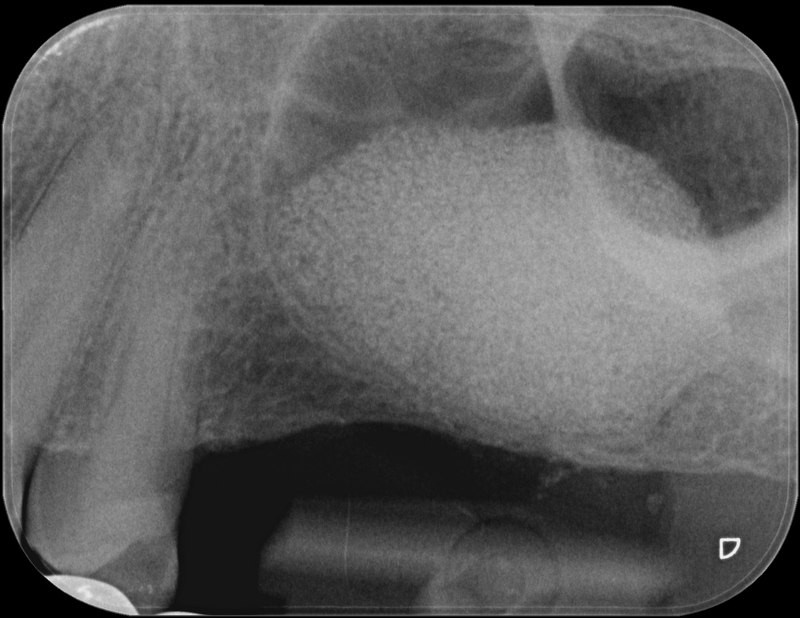 If the perforation is larger then the dentist may prefer not to complete the sinus lift and wait for the membrane to heal. The sinus lift can be redone after the membrane has healed. A sinus membrane may take 3-4 months to heal. Usually the healed membrane is thicker and more resistant so the second attempt is generally ‘easier’. Infections although quite rare can occur. This can lead to the graft not integrating with the natural bone. This may happen if the grafted area has a poor blood supply. Swelling and pain which gradually gets worse with time, it is normal for discomfort and pain for 2-3 days afterwards. Usually this is controlled with painkillers, however if you have progressive pain contact your surgeon. Persistant bleeding 2 days after the surgery. 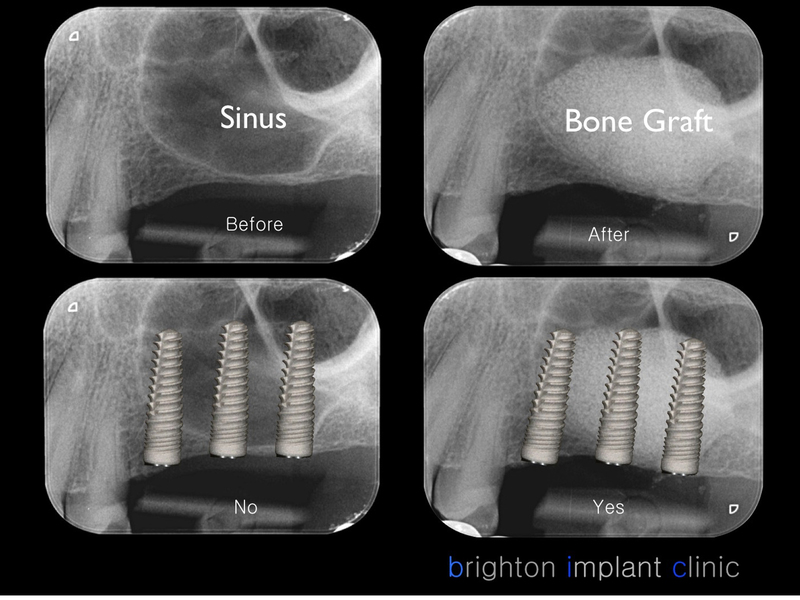 Brighton Implant Clinic is a group of three clinics which provide dental implant solutions for patients with missing teeth. Our surgeons have experience in all aspects of dental implantology. Ready To Find Out More about Sinus Lift?